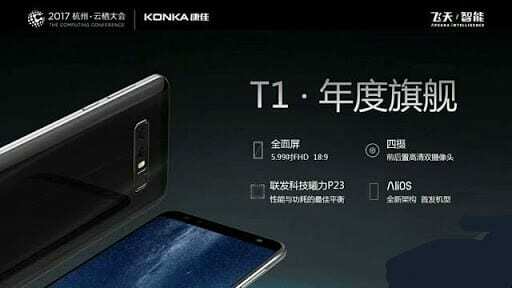 The Konka T1 has been launched in China by the company as their flagship smartphone. According to Konka, the T series will be their “flagship” line and the T1 will have powerful successors as well. The company takes centre stage when it comes to making smartphones that gives great value for money. Apart from the storage space, the device also boasts of the trending dual rear camera. Without further ado, lets see what the Konka T1 has to offer. 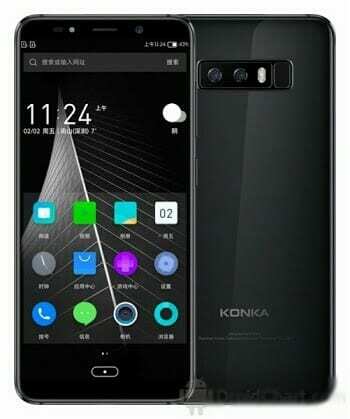 What is Konka T1 Price and Availability Status? Sports a Metal overall unibody that reflects light beautifully. At first glance, the device looks like a Samsung Galaxy Note 8 clone with the way the rear features are aligned. We can see the dual camera with the LED flash and the fingerprint scanner. All in a horizontal position at the top middle, giving us the Note 8 vibe. The OEM claimed their territory at the bottom corner. Turning over to the sides, it measures 7.9 mm in thickness and weighs just 169g overall. The beast was launched in Black, other colors might be released as well. The dishes out a Full View display for user with its massive screen. There’s no physical home button or navigation buttons at the bottom. But there’s a selfie camera, LED flash, earpiece and sensors at the top. Focusing on the screen, the 5.99-inch FHD+ IPS LCD capacitive touchscreen is big enough for your viewing pleasure. The screen has a resolution of 1080 x 2160 pixels and 403 pixel per inch density and displays stunning visuals. It also has a 85% NTSC and stretches up to 80% screen to body ratio. Behind this beast is the MediaTek Helio P23 (MT6763T) with octa-core processor and 64-bit CPU architecture. The 8-cores of processor on this powerful smartphone clocks at 2.3GHz alongside 16nm process technology. The ARM Mali-G71 MP2 graphics processor handles graphics with 2-cores and clocks at 770 MHz. Handle heavy apps and tasks, multitask through them with its massive 16GB of RAM with 1.6GHz in memory speed. In terms of storage, the 64GB Storage space is ready to accommodate all files, of course you can upgrade up to 128GB as well. 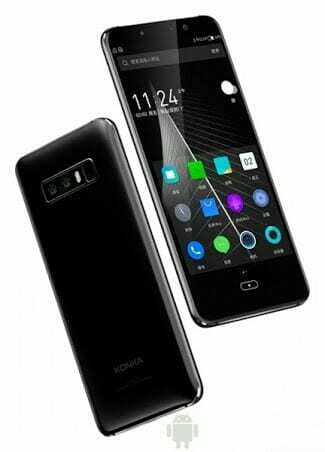 The Konka T1 runs on Android 7.0 Nougat with Yun OS 6.0 skin. The dual 12MP + 5MP rear shooters capture photographs with 4160 x 3120 pixels in dimension. The 12MP camera has f/2.2 aperture and comes with a LED flash and lots of quality features as well. Easily record FHD videos of 1080 pixels at 30fps, while the 16MP selfie camera has a dedicated LED flash for night selfies as well. Powering the Konka T1 is a 3450mAh non-removable Li-Po battery with fast charging technology. With the fast charging feature, it shouldn’t take up to 2 hours to fully charge up the battery from 0% to 100%. The Konka T1 is available on Shopping stores from $399 (N130,000) to $449 (N155,000). Click on the links above to view the latest Konka T1 price & availability on Shopping stores.